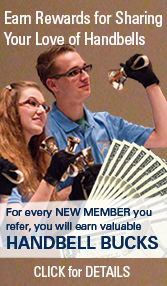 Use any of these graphics as your Facebook Timeline Cover photo to show your passion for handbells and support of the Guild. 1) Be sure you are using Timeline mode in Facebook (Please note: once you switch your Facebook to Timeline mode, you cannot switch back, so be sure this is what you want to do). 2) Right click on the graphic you wish to use and choose “Save Picture as…” or ctrl-click if using a Mac. Save the picture to your desktop. 4) Locate the photo and upload.